Photo by Bryan Stevens A male red-winged blackbird sings from an elevated perch in a wetland habitat. I recently received an email from Tom and Helen Stetler in Elizabethton, Tennessee. The couple reported seeing several “early birds” in their yard recently, including American robins and a total of six red-winged blackbirds. “One even went up on the bird feeder,” they wrote. The couple noted that red-winged blackbirds are usually harbingers of spring, but these birds arrived with some of the last of the wintry weather in February. Photo Courtesy of Tom and Helen Stetler A male red-winged visits a feeder at the Stetler home in Elizabethton. I’ve long come to associate red-winged blackbirds with early spring. 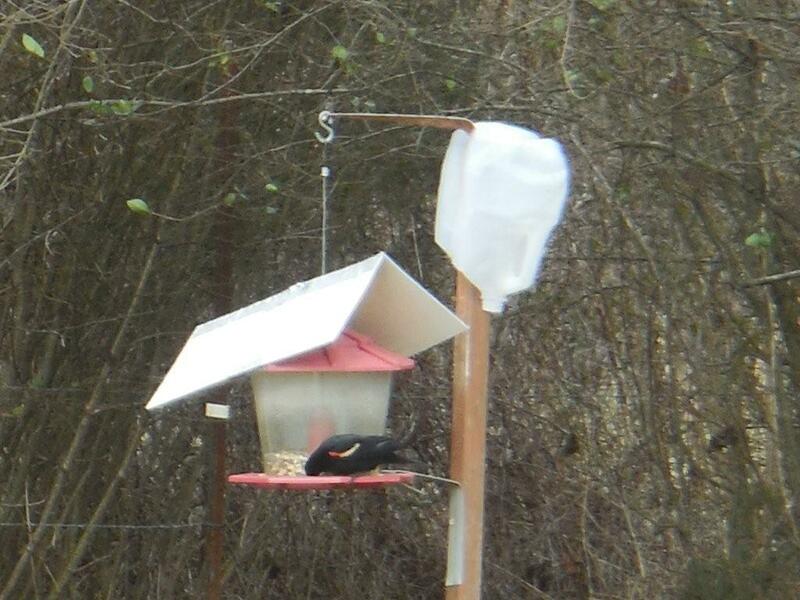 I also had a single red-winged blackbird make a one-day visit in February during a snowstorm. Those February visitors are the vanguard of large numbers of red-winged blackbirds that return in impressive numbers every March. The blackbirds arriving now behave much differently than the quiet, furtive ones that often make brief visits to feeders during late winter snowstorms. The showy and loud red-winged blackbirds that have returned to my fish pond and adjacent stands of cattails immediately made themselves at home. 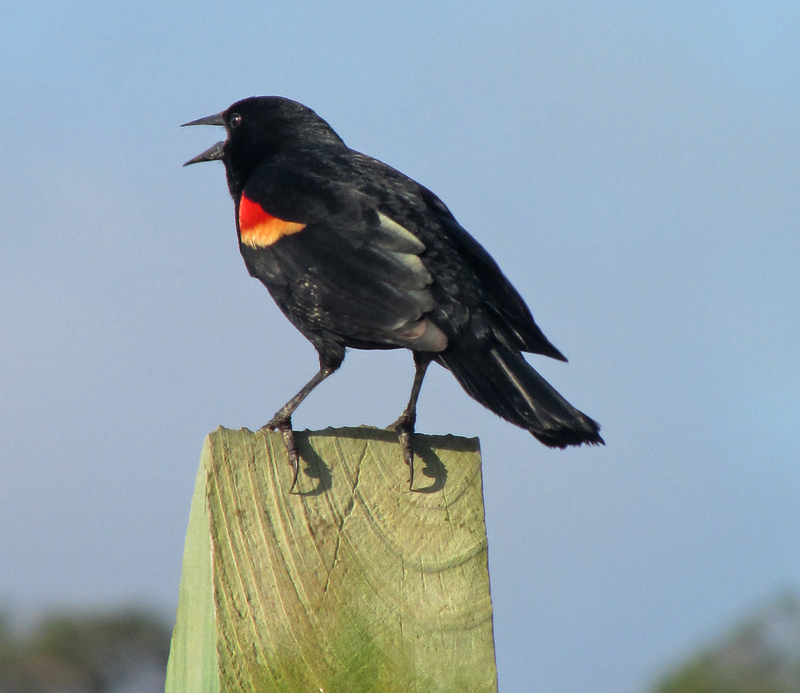 “The kon-ke-ree song of the male red-winged blackbird is a sure indication that spring is on the way,” according to a profile located at the Tennessee Watchable Wildlife website. At this time of year, the male red-winged blackbirds seek elevated perches to display and vocalize. Their loud antics are not designed solely to attract mates. 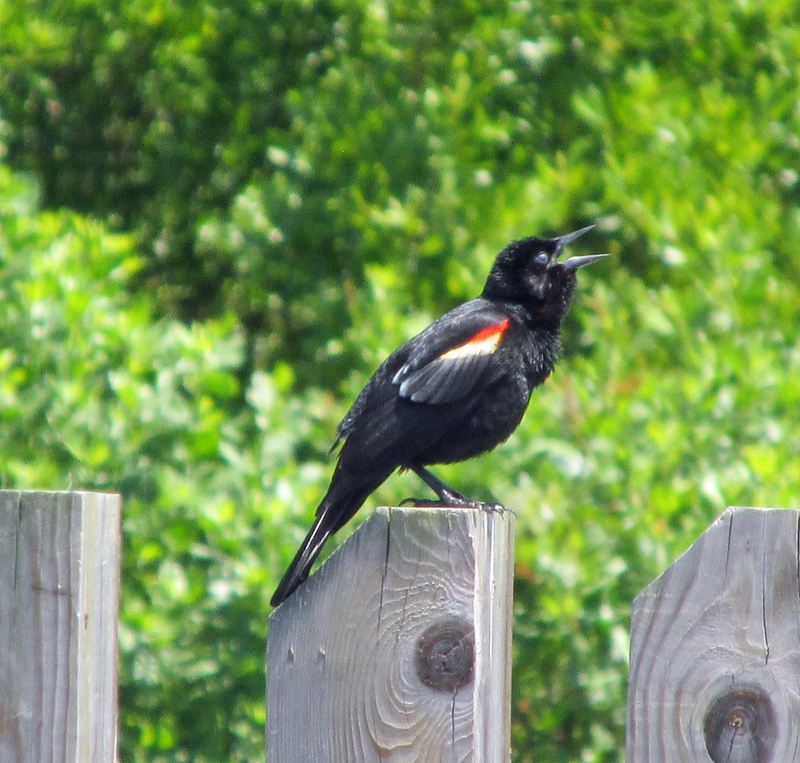 Male red-winged blackbirds also sing to warn rival males from intruding into their territories. The male red-winged blackbirds is a very aptly named bird. Glossy black males sport red wing patches that are often trimmed with a narrow band of yellow feathers. By contrast, female red-winged blackbirds are mostly brown birds that could easily be mistaken for large sparrows. Both sexes have sharply pointed bills. Photo by Bryan Stevens Male red-winged blackbirds sing to proclaim territories and attract mates. Red-winged blackbirds are fond of wetlands. Any marsh or even a damp field or flooded pasture is likely to attract a few resident red-winged blackbirds. Females choose nesting locations in cattails or other marsh vegetation. She usually lays three or four eggs. Although she does receive some help from the male, most of the responsibility for raising the young is left to her. 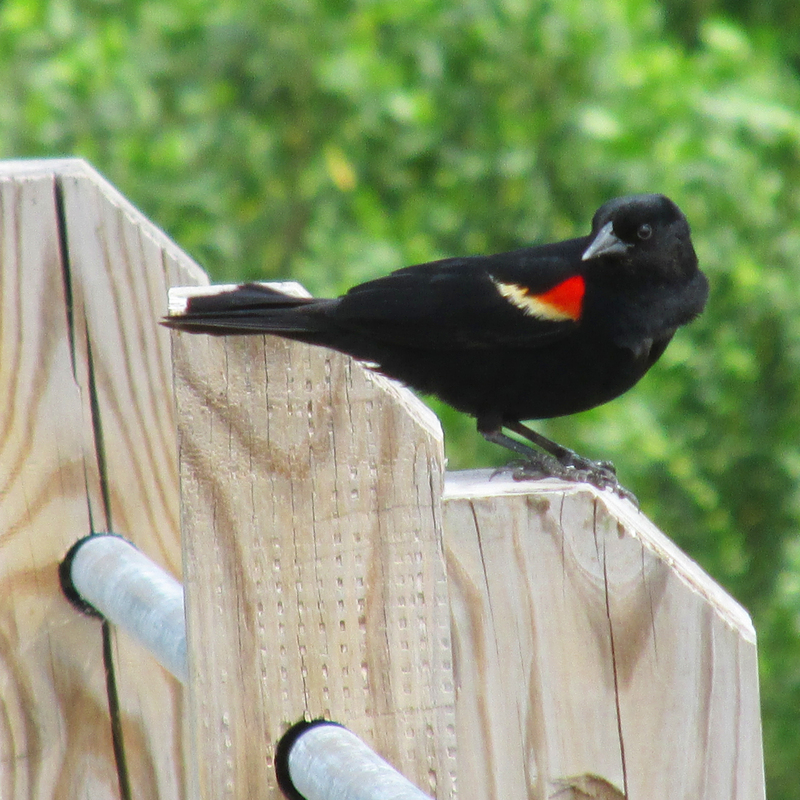 There is a reason that male red-winged blackbirds are not always quite as engaged in feeding and tending their young. Male red-winged blackbirds are often polygynous, which means that males will often court multiple mates. His time is often occupied defending females and their respective nests from the advances of other male red-winged blackbirds. Other relatives of the red-winged blackbird in the United States include the tri colored blackbird found along the Pacific Coast and the yellow-headed blackbird resident in wetlands west of the Great Lakes. Rusty blackbird, common grackle and brown-headed cowbird are other species of blackbirds found in Tennessee, Virginia and North Carolina. Some other signs of spring I’ve detected at home have included a bonanza of spring blooms, choruses of spring peeper frogs and even the fluttery flights of a few early butterflies. Of course, even as I write this week’s column, an unwelcome cold front has plunged temperatures below freezing. It’s only a temporary setback, so I know that spring will continue to advance. My evidence? A range of other birds are poised to return in the coming weeks. Once again, birds like red-winged blackbirds and American robins are just part of the vanguard of returning spring migrants. Spring migration begins as a trickle in March only to explode into a torrent in April and early May. Photo by Bryan Stevens Red-winged blackbirds generally return to Northeast Tennessee as the weather turns milder in the spring. If you would like to share your own spring sightings, send me an email at ahoodedwarbler@aol.com. I am especially interested in hearing about the first arrival dates of ruby-throated hummingbirds. If you’ve seen your first ruby-throated hummingbird of the spring, contact me with the date and time you saw your first hummer of the season. This entry was posted in Birding, Birds, Red-winged Blackbirds and tagged Birding, birds, Bristol Herald Courier, Bryan Stevens, Carter County Compass, Elizabethton Star, Erwin Record, Feathered Friends, McDowell News, Our Fine Feathered Friends, Red-winged Blackbird, Songbirds, Spring migration, The Erwin Record on April 3, 2016 by Bryan Stevens.